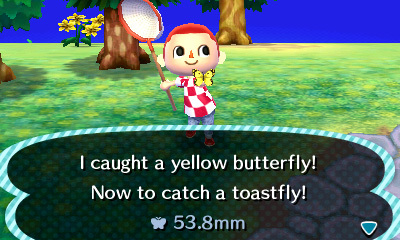 The thing that pleases us the most about New Leaf is that it’s on a handheld. Untold hours were wasted playing Animal Crossing on GameCube, and Let’s Go To The City on Wii was all well and good, but it’s 2005’s Wild World on the DS that we have the fondest memories of. For a ten minute play or an hour long session Animal Crossing is ideal for either, making it perfectly suited for on-the-go gaming. Words cannot express how pleased we also are that Nintendo didn’t choose Animal Crossing for their first voyage into the murky depths of free-to-play. It would have been the perfect candidate after all, with micro-transactions to speed up building developments and in-app purchases to buy new items and whatnot. Such a thing may have helped to attract newcomers to Nintendo’s wonderful world, but even so, adapting a similar formula to the countless village building games available on Apple’s App Store would have been an utter travesty. See, the joy about the Animal Crossing games – and New Leaf in particular – is that everything is drip fed slowly. At Nintendo’s own pace, if you will. It’s very hard to think of any other game that gives you something new to investigate every day. Just to put things into perspective, the ability to travel to a tropical island in search of rare fruits, fish and bugs doesn’t become available until around a week after setting foot in town. 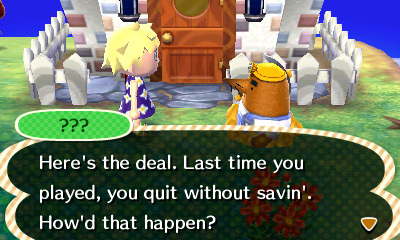 New Leaf’s biggest shake up is that you’re now the Mayor rather than a random villager. The future of your randomly generated village is entirely in your hands as you now call the shots as to what new buildings – including a cafe and a police station – should be placed and where, although not before the town’s approval ratings have reached 100%. In order to get the privilege of sitting behind the Mayor’s desk you’ll have to get your hands dirty and make friends with the townsfolk first. You’d think as Mayor the oddball animal villagers would present you with a mansion or country getaway to live in, but no – you start with a grotty little tent. This isn’t entirely a bad thing as paying off a loan for a bigger place to live provides something to focus on. Fancy a different roof? Or a new fence? 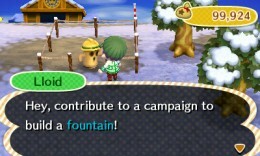 The curiously helpful Tom Nook can supply these things and many more, but such upgrades take both time and money. As you make your daily jaunt around the village new things are frequently found, such as travelling peddlers who only visit once a week, or buildings under construction that aren’t revealed until the next day. And like before, everything is run like clockwork. Shops are only open certain times of the day, and some visitors only appear for a few hours. Miss an event and you may have to wait a week to catch it again. 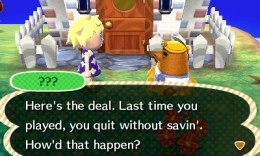 Indeed, you don’t play Animal Crossing – it plays you. Even at night though when the shops are shut there’s still stuff to do. That museum isn’t going to fill itself with fossils, sea-life and creepy crawlies. There are more collectables than ever before – it’s even possible to buy (or hire) a wetsuit and go diving for underwater for creatures of the deep. Also: barnacles. Online functions now play a huge part. It’s not quite a drop in/drop out experience – but the 20 second or so wait every time somebody enters and leaves your town is excusable. Up to three friends can visit at once and, amazingly, you aren’t forced to converse with pre-written sentences. Lord praise Nintendo for finally giving us the freedom of speech. 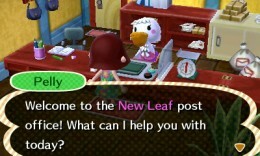 Best friends can be added to a list and sent invites whenever the town gates are open – Nintendo has clearly put a lot of thought into how to bring players together. As you may expect there’s an emphasis on sharing – players start with just one type of fruit tree, and so to turn your town into a colourful fruit-bearing orchard you’ll need to swap with others. Town hopping is also a good way to collect all pieces of furniture in a set – the more shops visited the better chances of finding something you want. As a word of warning rather than a criticism, those who choose to play New Leaf alone will miss out on some of its finest moments. Neat little touches are in abundance, like if a villager in another town takes a shine to you they may pack their bags and hop onto the next train to yours. Even simply discovering how others have customised their homesteads is a pleasure. This is also one of the few 3DS games with photo sharing, allowing snapshots to be added to Facebook and Twitter via the 3DS’s browser. Believe us, there’s huge potential for tomfoolery given the situations provided. 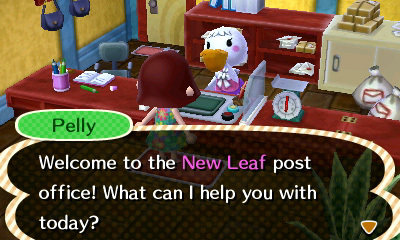 In many ways New Leaf is the perfect sequel – it adds countless new playthings, improves on existing ideas and the overall structure is sturdier than ever. Big name blockbusters like Bioshock Infinite and The Last of Us may be pushing the envelope of storytelling and visual prowess but when these games are sat on the shelves gathering dust, New Leaf will still have new things to offer. Whether you’re a newcomer or series veteran, get ready to be at Tom Nook’s beck and call at all unearthly hours. I’m struggling to not get this. Don’t really want to get a 3DS just for this. It seems too addictive anyway. How about Fire Emblem or Monster Hunter? They’re killer apps/AAA titles too…or however you want to put it. Fire Emblem does look really good (I’m not into Monster Hunter so much). Annoyingly Amazon jacked the price back up from £120 to £150, so I might wait a little while. Getting one now would destroy my productivity anyway.